Guide IR510N2 WIFI Thermal Camera Outdoor is a pocket-sized thermal vision monocular for detecting the body heat of animals and people in any terrain, day or night. The thermal imaging monocular is used for track game, recover downed animals, watch for predators, and stay aware of your surroundings after darkness falls. Guide IR510 Nano handheld thermal monocular helps you detect people or animals over 500 meters away and detect vehicle over 1300 meters away. 1. Long Range Detection: The IR510 N1 detects heat signatures of people, animals, Vehicle and terrain up to 500 meters-1300 meters (700m-1700m for IR510 N2) away with better image. 2. Wi-Fi for remote control: to display synchronously, realizing photo/video/screen sharing. •Long Range Detection: The IR510 N1 detects heat signatures of people, animals, Vehicle and terrain up to 500 meters-1300 meters (700m-1700m for IR510 N2) away with better image. •Wi-Fi for remote control: to display synchronously, realizing photo/video/screen sharing. • Small pocket size and ergonomic design: it is more confortable to use on a long period of detection. • Longer battery working time: Built-in battery life up to 5 hours, external power supply available. 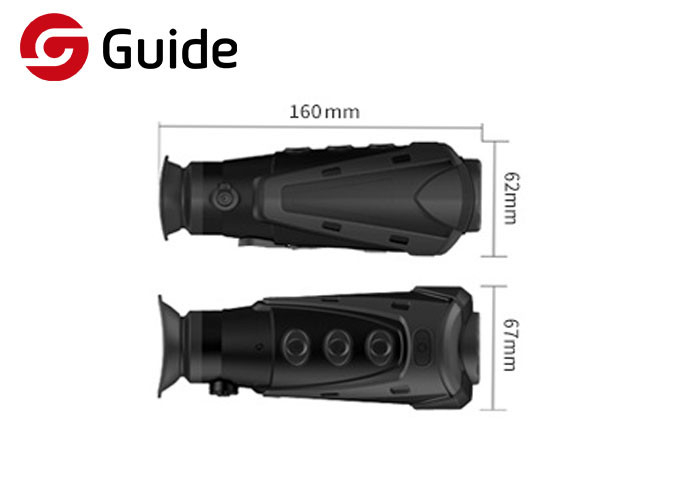 Guide IR510N2 WIFI Thermal Camera Outdoor is the Guide beginner level Handheld Thermal Monocular which is widely used for hunting, outdoor sports, search and rescue, law enforcement, and personal home security at night and other activities outdoor or in bad weather. The thermal imaging monocular can detect a target in deep cover or hidden by fog. The thermal imaging monocular doesn't require a light source. If you hunt deep in the mountains where ambient light is not available, thermal optics is your best choice. The thermal optics could see in any light condition, night or day, seeing through brush, and tracking residual heat like recent footprints.